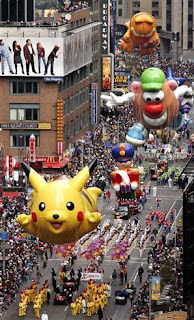 You don't have to be Stateside to enjoy one of the most fantastic of American Thanksgiving traditions -- the Macy's Thanksgiving Parade! Monstrous balloon cartoon characters floating through the Big Apple entertain children & adults alike! If you can't be there in person (I'm going for the 1st time ever! ), watch on television, or later on YouTube, and forget all your worries and just ENJOY! Sure to bring a smile to your face. I think I may have just watched too many episdoes of Friends, but I wish we had Thanksgiving here. The parade and food looks like we're really missing out.